Shared from GreenMedInfo.com Content, © 12/12/2017 GreenMedInfo LLC. This work is reproduced and distributed with the permission of GreenMedInfo LLC. Want to learn more from GreenMedInfo? Sign up for the newsletter here http://www.greenmedinfo.com/greenmed/newsletter. Grounding: The Missing Element to Healing Autoimmunity? One characteristic intrinsic to the human experience is connection with the earth, that indelible interdependence with a foundational and primordial element, representing the antecedents from which we came and the soil to which we will return. Grounding to the earth galvanizes our senses and reawakens our ancient connection with the limitless free electron source residing in our planet. In essence, the ground represents a reservoir of free and mobile electrons, or negative charges that have the potential to neutralize the positively charged free radicals, or reactive oxygen species (ROS), that can damage cell constituents and lead to disease and degeneration. Free radicals, such as hydrogen peroxide, hydroxyl radical, and superoxide anion radical are inherently unstable compounds that are both byproducts of aerobic metabolism and synthesized through different physiochemical and pathological states (1). Admittedly, free radicals play hormetic or adaptive roles as signaling molecules in redox biology for maintenance of cellular homeodynamics (2), and may have in fact evolved as an essential signal transduction mechanism to enable changes in response to accessibility of environmental nutrients (3, 4). However, free radicals present in excess lead to a condition known as oxidative stress, which is the breeding ground for autoimmune disease and other chronic conditions including diabetes mellitus, cancer, ischemic diseases such as coronary artery disease, stroke, hypertension and preeclampsia, and neurodegenerative diseases including Parkinson’s and Alzheimer’s (1). With respect to autoimmune disorders such as rheumatoid arthritis, systemic lupus erythematosus, and Sjögren’s syndrome, studies have shown that most patients have excessive burdens of oxidative stress or inadequate antioxidant defense systems compared to healthy controls (5). Oxidative stress is implicated in the pathophysiology of autoimmune disorders because an imbalance between free radicals and antioxidants up-regulates inflammation, stimulates apoptosis or cell suicide, and also induces loss of immunological tolerance, or the ability to distinguish self from non-self (5). The surface of the planet is electrically conductive…and its negative potential is maintained (i.e. its electron supply replenished) by the global atmospheric electrical circuit. Mounting evidence suggests that the Earth’s negative potential can create a stable internal bioelectrical environment for the normal functioning of all body systems (Chevalier et al. 2011). The living matrix of the human, comprised of a “continuous molecular fabric of the organism, consisting of fascia, the other connective tissues, extracellular matrices, integrins, cytoskeletons, nuclear matrices and DNA,” participates in the exchange of electrical charges in order to maintain a state of equilibrium or homeostasis, allowing the transfer of charges as a preemptive strategy to mount an inflammatory response should infection or injury occur (7). To illustrate the magnitude of exchange of electrons in health, researchers discuss that patients with inflammatory disorders may actually deplete therapists during body work, massage, or hands-on energy medicine sessions (7). Thus, the influx of free electrons through barefoot contact with the earth, which are disseminated through intracellular biopolymers and the amorphous gelatinous material known as the ground substance of the extracellular tissue, has the potential to reduce acute and chronic inflammation through this mechanism (7). In modern industrial societies, we have forsaken our quintessential link to nature, no longer oscillating with the natural cycles and exhibiting sacred reverence for the day-night, cosmic, seasonal, and interstellar forces, but rather adopting attitudes of superiority over nature and perceiving nature as an entity to be exploited and conquered. This loss of harmony with the natural rhythms is not only detrimental to our human psyche, which evolved to be fundamentally attuned to nature, but it also negatively impacts our health which is so inextricably linked with exposure to sunlight, the sounds of the natural world, and grounding with the earth. Throughout the majority of evolutionary history, human beings slept on the group, went shoeless, or wore footwear fashioned from animal hides that allowed equilibration with the electrical potential of the earth, practices which have been discarded with what is perceived as the linear trajectory of human kind towards a pinnacle of advancement. However, our divorce from the earth is in some ways a regression, since we lost that pivotal energetic transfer from the ground to the body. By deviating from these primordial practices, alongside inundation with toxicants, electromagnetic radiation, genetically engineered, irradiated, and nutrient-poor food, the modern lifestyle has bred a climate ripe for disease. The advent of plastic or rubber soled shoes, elevated beds, and high-rise buildings, which insulate the body from the electrical field of the earth, has coincided with unparalleled increases in the epidemic of chronic illness, including autoimmune disease (8). Not only that, but it decimates our defenses against electromagnetic pollution, as studies have demonstrated that grounding reduces the voltage induced on the body by a factor of seventy upon exposure to alternating current (AC) electric potential (8). In other words, the transfer of electrons from the earth to the body prevents the ubiquitous electromagnetic frequencies from interfering with the electric charges and activities of molecules inside our bodies, which is not insignificant given that “there is no question that the body reacts to the presence of environmental electric fields” (8). Although direct contact with the earth is optimal, there are various conductive grounding systems commercially available that come as sheets, mats, adhesive patches, footwear inserts, or bands which can be worn or used inside the home for those who live with inclement weather conditions or who want to use grounding in clinical scenarios (9). When subjects are grounded during sleep using a conductive mattress pad, significant improvements in diurnal cortisol rhythm were observed, trending towards normalization (10). In other words, cortisol, the stress and awakening hormone, reverted to the normal pattern of being high in the morning and low at night. This normalizing effect on the circadian rhythm is important since prolonged stress, often a triggering factor in autoimmune disease, can cause glucocorticoid receptor resistance which culminates in an ongoing inflammatory responses (11). In the experiment, grounding led to better sleep onset latency, or the time it takes to fall asleep at night, as well as less sleep disruption and reduced night-time pain (10). Other studies have shown that grounded subjects exhibit less sleep dysfunction and significant relief from chronic joint and muscle pain compared to those in sham grounding conditions (12). Not only are individuals with sleep disturbances at increased risk for developing autoimmune disease (13, but impaired sleep perpetuates a cycle of pain (14), so a trial of a benign intervention such as grounding, which can truncate the vicious cycle, is of merit. In regards to chronic pain, a common affliction in autoimmune populations, grounding unequivocally altered biomarkers of pain and immune system activity in one study of delayed-onset muscle soreness (DOMS) in men following eccentric exercise. In the experiment, healthy men performed calf raises while carrying one-third of their body weight on their shoulders. Researchers witnessed that those in the sham group had a sharp spike in white blood cells and greater pain perception, indicative of an inflammatory reaction, whereas those who were grounded had a slight decrease in white blood cells, significantly less pain, and shorter recovery time (8). Patients with autoimmune diseases, including conditions such as ulcerative colitis, psoriasis, rheumatoid arthritis, Graves disease, and Hashimoto’s thyroiditis, are at increased risk of type 2, non-insulin dependent diabetes due to common mechanistic pathways (15). Blood sugar dysregulation, as well as insulin resistance, are also common antecedents or predisposing factors in the onset of autoimmune disease. Thus, it is promising that earthing has been shown to decrease fasting glucose among diabetics with poor glycemic control when implemented over a three-day period (8). Grounding has been proven to produce measurable changes in immune hyper-responsiveness, including changes in white blood cell counts, concentrations of inflammation-mediating cytokines, and other molecules that are involved in mounting inflammatory responses (9). Not only does grounding mitigate the cardinal signs of inflammation, including dolor (pain), calor (heat), tumor (swelling), rubor (redness), and function laesa (loss of function), but medical infrared imaging studies have shown that grounding precipitates rapid resolution of inflammation (9). Researchers Oschman and colleagues (2015) theorize that earth-derived electrons can contribute to resolution of smoldering or silent inflammation and also, “suggest that mobile electrons create an antioxidant microenvironment around the injury repair field, slowing or preventing reactive oxygen species (ROS) delivered by the oxidative burst from causing ‘collateral damage’ to healthy tissue, and preventing or reducing the formation of the so-called ‘inflammatory barricade’” (9).The oxidative burst is the rapid production of free radicals by neutrophils, a subset of immune cells that invade injured sites and generate signals to induce repair, clear cellular debris, and eradicate pathogens (16). However, ROS are also capable of inducing damage to healthy cells, and their detrimental effects can be alleviated by earthing. On the other hand, the inflammatory barricade that is erected with insult or injury walls off damaged tissue or infection to effectively prohibit migration of pathogens or debris into healthy tissue. However, the inflammatory barricade can lead to chronic inflammation because it impedes the navigation of regeneration-promoting cells and antioxidants into the sequestered area. Researchers hypothesize that this cycle of persistent inflammation secondary to the inflammatory barricade can be arrested via grounding, which saturates the body with electrons, reverses the ‘electron deficiency’ that engenders the barricade in the first place, and enables wound healing (9). One hallmark of autoimmune rheumatic diseases is over-production of inflammation-inciting cellular messengers known as pro-inflammatory cytokines, which potently activate the hypothalamic-pituitary-adrenal (HPA) axis which oversees our stress response (17). This leads to a cellular milieu where pro-inflammatory autoimmune-exacerbating hormones predominate over anti-inflammatory hormones such as glucocorticoids, which sets up an inflammatory cascade favoring tissue destruction (17). However, earthing has been observed to influence this often dysregulated hypothalamic-pituitary-adrenal-thyroid axis (8). In fact, some individuals need to taper down their dose of thyroid medication after beginning grounding in order to circumvent hyperthyroid symptoms, presumably because their thyroid glands begin to work more efficiently (8). Research has elucidated that the majority of autoimmune disorders, including as systemic lupus erythematosus (SLE), inflammatory bowel disease (IBD), and Behçet’s syndrome are all accompanied by increased propensity for venous thromboembolism (VTE), or blood clots that form in deep veins (18). This is likely because of perturbations in the innate immune system and the fact that “Systemic inflammation modulates thrombotic responses by suppressing fibrinolysis, upregulating procoagulant, and downregulating anticoagulant” (18). These processes favor clot formation and prevent the degradation of blood clots. Luckily, experimenters found that healthy subjects grounded for two hours demonstrated significantly less aggregation of red blood cells, indicating a substantial reduction in blood clotting potential (19). In addition, the grounded participants possessed greater zeta potential, which is a marker for the ability of red blood cells to repel each other (19). In fact, the anticoagulant effect of earthing is so potent that international normalized ratios (INRs) must be supervised by physicians when an earthing regimen is undertaken by an individual on a blood-thinning medication like coumadin (8). Grounding has been shown to shift the autonomic nervous system from sympathetic fight-or-flight to parasympathetic rest-and-digest, also known as breed-and-feed. In fact, participants in an earthing condition exhibited immediate deactivation of the former and concomitant activation of the latter (20). Experimenters observed that subjects who were grounded exhibited various parameters, such as increased respiratory rate and stabilization of blood oxygenation, both indicative of a metabolic healing response that requires enhanced oxygen supply (20). In addition, grounding improves heart rate variability (HRV), a measure of regulation of the autonomic nervous system and a surrogate marker for cardiovascular risk when low (21). Preliminary studies have revealed that between twenty-four and one hundred percent of patients with autoimmune disease experience autonomic dysfunction, also known as dysautonomia, meaning that they have impaired regulation of bodily functions governed by this all-encompassing system (22). The autonomic nervous system is responsible for diverse functions such as urination, defecation, digestion, heart rate, blood pressure, pupillary response, and sexual arousal, so dysautonomia can disrupt all of these largely unconscious physiological activities. Thus, grounding is suggested to be a viable complementary therapy for autoimmune disease, especially in cases where sympathetic tone predominates over parasympathetic. Enhanced activity through the parasympathetic branch also improves the bidirectional communication network between the central nervous system (brain and spinal cord) and gut-associated lymphoid system (GALT) known as the gut-brain axis, leading to better intestinal blood flow, motility, and gastric secretions, all of which optimize digestion and discourage bacterial overgrowth, gastrointestinal infections, and intestinal permeability (23), which represent root causes of autoimmune disease. Moreover, improved parasympathetic tone activates efferent or outward-conducting fibers of the longest cranial nerve in the body, known as the vagal nerve, which extends from the brainstem to the abdomen and interfaces with most internal organs including the heart, lungs, and digestive tract. Studies have revealed that electrical grounding improves vagal tone in both adults and preterm infants, possibly reducing neonatal morbidity, improving stress resilience, and engendering autonomic balance (24). The vagal nerve also innervates or supplies receptors on immune cells, which have the effect of influencing the peripheral immune system in an anti-inflammatory direction when activated (25, 26, 27). In addition, stimulating anti-inflammatory neurotransmission through the vagal nerve dampens down the activity of glial cells, leukocytes, and macrophages, parts of the immune system which produce pro-inflammatory signaling molecules which can exacerbate autoimmune disease (28). In the absence of contact with the earth, distorted electrical gradients can amass due to heterogenous charge distribution. This uneven distribution of charges can in turn affect the functioning of enzymes, essential proteinaceous elements which catalyze the reactions that drive life itself. This occurs because the pH of biological fluids and even the three-dimensional conformation of molecules, upon which their proper activity is contingent, can be influenced by charge perturbations in the environment. Binding of substrates, or the precursor molecules for chemical reactions, to active sites on enzymes, is influenced by the electrical microenvironment. Similarly, the ability to donate or accept hydrogen atoms, and the activity of voltage-gated ion channels which transport substances into or out of the cell, is all dictated by electrical charges. Correct timing of electrochemical impulses is vital to the functioning of the nervous system, so much so that variations in local electrical profiles can lead to aberrant firing and ensuing pathology (29). Rather than a woo-woo concept, flow of electrons, gravitating from the earth to the body, has been scientifically documented (30). Earthing has been transplanted from the realm of alternative medicine folklore to the domain of a scientifically substantiated therapy for ailments of many kinds, including aging, since aging is inextricably linked to inflammatory burden (31). In their review paper, Chevalier and colleagues (2012) discuss that undergoing an earthing practice has preliminary evidence of improving autoimmune conditions such as rheumatoid arthritis, multiple sclerosis, and lupus, presumably by the aforementioned biochemical mechanisms. Regular earthing may also elicit improvements in cardiovascular arrhythmias, hypertension, osteoporosis, asthma and other respiratory conditions, sleep apnea, and premenstrual syndrome (PMS) (8). Moreover, electrons supercharge the electron transport chain of the mitochondria, our energy-producing organelles, preventing onset of chronic fatigue syndrome (CFS) symptomatology (9). By being semi-conducted and dispersed through our connective tissue matrixes made of ground substance, cytoskeleton, collagen corridors, and body fluids, the electrons from the earth are able to quickly offset oxidative damage and protect healthy tissue (9). Throughout history, traditional cultures have referred to the biofields that surround our bodies as prana, cosmic ether, qi, the four humours, and the odic force, among multiple other names. The wisdom in these ancient concepts, which transcends cultural demarcations and spiritual designations, is being validated by the discovery that we reside within bioelectromagnetic bodies. Not only can we be conceptualized as beings of light, since we liberate quantum particles known as biophotons or ultra-weak photonic emissions, but we also emit electromagnetic fields, which are produced with the movement of electrical charges. In addition, innovations in biophysics and cellular biology are illuminating that, “the human body is equipped with a system-wide collagenous, liquid-crystalline semiconductor network known as the living matrix” (9) which is capable of directing electrons to any bodily location in the event of injury or disease in order to confer protection at the cellular, tissue, and organ level (21). In fact, this vast whole-body redox network which includes cell membrane proteins called integrins, pores across the nuclear envelop, nucleic proteins called histones, and architectural proteins such as microtubules and microfilaments, is being considered the primary antioxidant system of the body in some research circles (9). In other words, the body acts as both a storage facility and dissemination service to absorb or donate antioxidant electrons to site of disease or degeneration, in a process facilitated by grounding (9). Researchers in fact state that damaging oxidant molecules may have evolved as part and parcel of the inflammatory and pathogen-fighting response only because the infinite electron source that is the earth was available to counteract their deleterious effects (9). As articulated in the scientific literature, “Electrons from the earth may in fact be the best antioxidants, with zero negative secondary effects, because our body evolved to use them over eons of physical contact with the ground” (9). Thus, this substrate of energy, which animates us and governs our finely-orchestrated physiological phenomena, is essential to health. The surface of the earth, therefore, represents an untapped and indispensable therapeutic resource with the potential to improve a myriad of inflammatory maladies. Failing to recharge our bodies with regular contact with the earth, is a certain recipe for degeneration, demise, and debility. 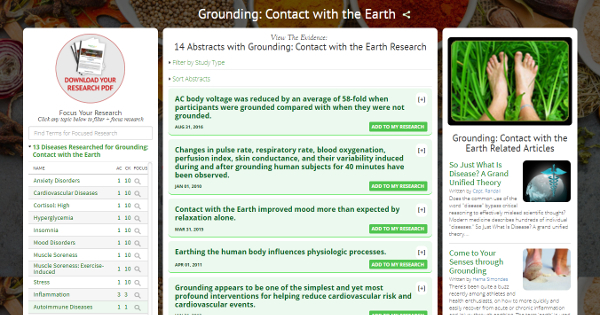 For additional research on the health beneftis of grounding, visit our database on the subject. 1. Lobo, V. et al. (2010). Free radicals, antioxidants and functional foods: Impact on human health. Pharmacognosy Review, 4(8), 118-126. 2. Schieber, M., & Chandel, N.S. (2014). ROS Function in Redox Signaling and Oxidative Stress. Current Biology, 24(10), R453-R462. 3. Wood, Z.A., Poole, L.B., & Karplus, P.A. (2003). Peroxiredoxin evolution and the regulation of hydrogen peroxide signaling. Science, 300, 650–653. 4. Kiley, P.J., & Storz, G. (2004). Exploiting thiol modifications. PLoS Biology, 2, e400. 5. Kumagai, S., Jikimoto, T., Saegusa, J. (2003). [Pathological roles of oxidative stress in autoimmune diseases]. Rinsho Byori, 51(2), 126-132. 6. Young, I.S., & Woodside, J.V. (2001). Antioxidants in health and disease. Journal of Clinical Pathology, 54, 176-186. 7. Oschman, J.L. (2009). Charge transfer in the living matrix. Journal of Bodywork and Movement Therapy, 13(3), 215-218. 8. Chevalier, G. et al. (2012). Review article: Earthing: Health Implications of Reconnecting the Human Body to the Earth’s Surface Electrons. Journal of Environmental and Public Health, 1-8. 9. Oschman, J.L., Chevalier, G., & Brown, R. (2015). The effects of grounding (earthing) on inflammation, the immune response, wound healing, and prevention and treatment of chronic inflammatory and autoimmune diseases. Journal of Inflammation Research, 8, 83-96. 10. Ghaly, M., & Teplitz, D. (2004). The biologic effects of grounding the human body during sleep as measured by cortisol levels and subjective reporting of sleep, pain, and stress. Journal of Alternative and Complementary Medicine, 10(5), 767-776. 11. Cohen, S. et al. (2012). Chronic stress, glucocorticoid receptor resistance, inflammation, and disease risk. Proceedings of the National Academy of Sciences, 109(16), 5995-5999. 12, Ober, C. (2000). Grounding the human body to neutralize bioelectrical stress from static electricity and EMFs. ESD Journal. 13. Hsiao, Y-H. (2015). Sleep Disorders and Increased Risk of Autoimmune Diseases in Individuals without Sleep Apnea. Sleep, 38(4), 581-586. 14. Roizenblatt, M. et al. (2012). Pain-related diseases and sleep disorders. Brazilian Journal of Medical Biology Research, 45(9), 792-798. 15. Hemminki, K. et al. (2015). Subsequent Type 2 Diabetes in Patients with Autoimmune Disease. Scientific Reports, 5, 13871. 16. Tidball, J.G. (2005). Inflammatory processes in muscle injury and repair. American Journal of Physiology, Regulatory, Integrative and Comparative Physiology, 288(2), R345-R353. 17. Jara, L.J., et al. (2006). Immune-neuroendocrine interactions and autoimmune diseases. Clinical and Developmental Immunology, 13(2-4), 109-123. 18. Zöller, B. et al. (2012). Autoimmune diseases and venous thromboembolism: a review of the literature. American Journal of Cardiovascular Disease, 2(3), 171-183. 19. Chevalier, G. et al. (2013). Earthing (Grounding) the Human Body Reduces Blood Viscosity—a Major Factor in Cardiovascular Disease. Journal of Alternative and Complementary Medicine, 19(2), 102-110. 20. Chevalier, G. (2010). Changes in pulse rate, respiratory rate, blood oxygenation, perfusion index, kin conductance, and their variability induced during and after grounding human subjects for 40 minutes. Journal of Alternative and Complementary Medicine, 16(1), 1-7. 21. Fleisher, L.A. (1996). Heart rate variability as an assessment of cardiovascular status. Journal of Cardiothoracic and Vascular Anesthesia, 10(5), 659-671. 22. Stojanovich, L. (2009). Autonomic dysfunction in autoimmune rheumatic disease. Autoimmune Reviews, 8(7), 569-572. 23. Fasano, A. (2012). Leaky gut and autoimmune disease. Clinical Reviews in Allergy and Immunology, 42(1), 71-78. 24. Passi, R. et al. (2017). Electrical Grounding Improves Vagal Tone in Preterm Infants. Neonatology, 112(2), 187-192. 25. Levy, G. et al. (2012). Vagal nerve stimulation modulates gut injury and lung permeability in trauma-hemorrhagic shock. Journal of Trauma, Acute Care, and Surgery, 73(2), 338-342. 26. Ulloa, L. (2005). The vagus nerve and the nicotinic anti-inflammatory pathway. Nature Reviews in Drug Discovery, 4, 673–684. 27. Wang, H. et al. (2003). Nicotinic acetylcholine receptor alpha7 subunit is an essential regulator of inflammation. Nature, 421, 384–388. 28. Tracey, K.J. (2017). Physiology and immunology of the cholinergic anti-inflammatory pathway. The Journal of Clinical Investigation, 117, 289-296. 29. Chahine, M. et al. (2008). Voltage-gated sodium channels in neurological disorders. CNS and Neurological Disorders—Drug Targes, 7(2), 144-158. 30. Applewhite, R. (2005). The effectiveness of a conductive patch and a conductive bed pad in reducing induced human body voltage via the application of earth ground. European Biology and Bioelectromagnetics, 1, 23-40. 31. Franceschi, C. et al. (2000). Inflamm-aging: an evolutionary perspective on immunosenescence. Annals of the New York Academy of Sciences, 908, 244-254. Ali Le Vere holds dual Bachelor of Science degrees in Human Biology and Psychology, minors in Health Promotion and in Bioethics, Humanities, and Society, and is a Master of Science in Human Nutrition and Functional Medicine candidate. Having contended with chronic illness, her mission is to educate the public about the transformative potential of therapeutic nutrition and to disseminate information on evidence-based, empirically rooted holistic healing modalities. Read more at @empoweredautoimmune on Instagram and at www.EmpoweredAutoimmune.com: Science-based natural remedies for autoimmune disease, dysautonomia, Lyme disease, and other chronic, inflammatory illnesses.